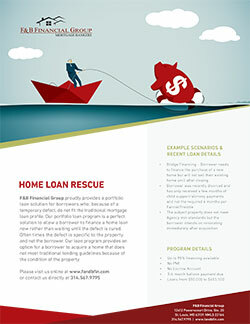 F&B Financial Group proudly provides a portfolio loan solution for borrowers who, because of a temporary defect, do not fit the traditional mortgage loan profile. Our portfolio loan program is a perfect solution to allow a borrower to finance a home loan now rather than waiting until the defect is cured. Often times the defect is specific to the property and not the borrower. Our loan program provides an option for a borrower to acquire a home that does not meet traditional lending guidelines because of the condition of the property.